The dramatic opening given here to Bridge’s glorious Phantasy Piano Quartet immediately sets the tone for a very fine disc. 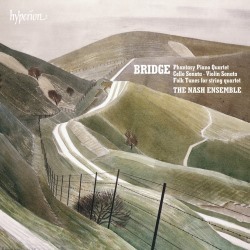 The quartet of Marianne Thorsen (violin), Lawrence Power (viola), Paul Watkins (cello) and Ian Brown (piano) give an excellent sense of both the flow and also the drama of the work in great gusts of breathtakingly fresh, bracing air. We have nicely agile playing with impeccable ensemble and intonation - and all very incisive. The following Cello Sonata, featuring Paul Watkins and Ian Brown, is full of poignancy, yearning and wistfulness – beautifully played by both parties. Then we have four folksongs: An Irish Melody: The Londonderry Air, Cherry Ripe, Sally in our Alley and Sir Roger de Coverley. Violinists Marianne Thorsen and Laura Samuel, Lawrence Power and Paul Watkins give gorgeous, idiomatic, nicely dancing, and passionate performances of these lovely settings for string quartet – although there is not quite the unity of attack that the players achieved in the Phantasy Piano Quartet, perhaps because with the piano one has the discipline of the immediacy of sound and decay. Wthis there seems to be an inclination for these players to play into each note, thus leading to a slight raggedness. The final work on the disc is the rarely-heard Violin Sonata with Marianne Thorsen and Ian Brown, who achieve a good energy and attack in the fast movements. However, in the slow and lyrical passages there is – despite the regulating involvement here of Ian Brown - a tendency for Thorsen to play slightly into the note each time, as if this has become a mannerism, rather than a conscious action or deliberate effect. The disc features excellent notes from Paul Hindmarsh – although the layout and design is rather clunky and dense; and the sound quality is also top-rate.